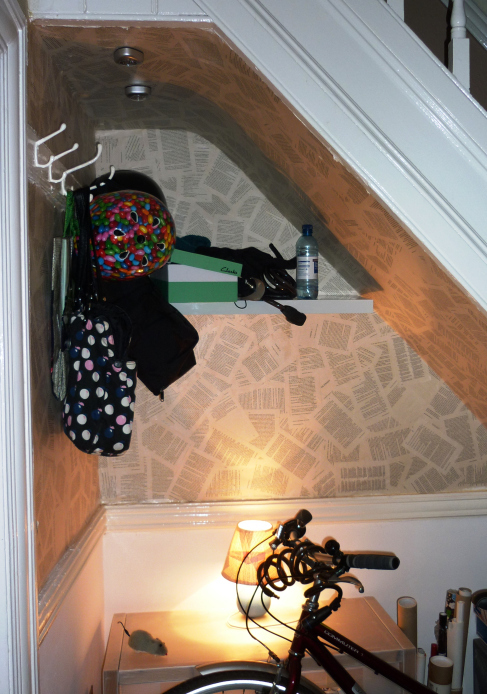 This is a combination of the result of my rubbish plastering skills and not finding the right wallpaper in the shops. 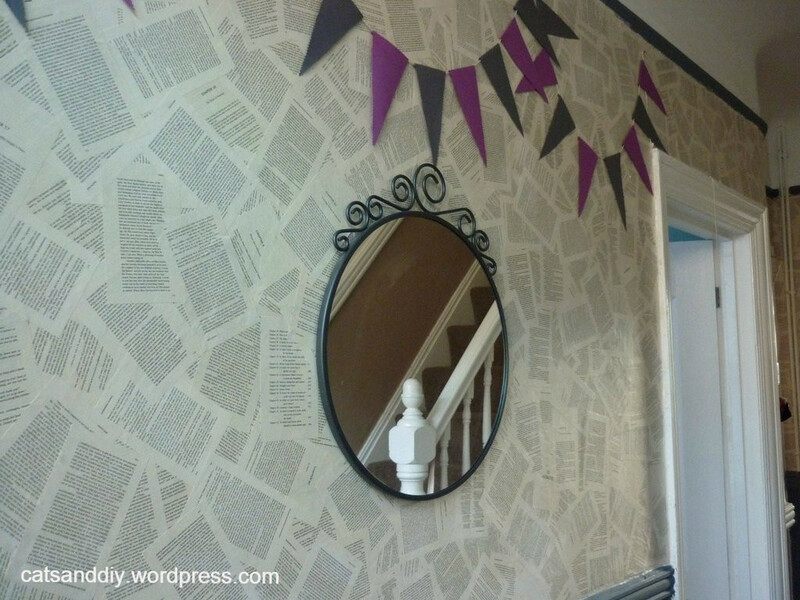 I had seen walls papered with maps and comics in a couple of places, and was wondering if you could do the same with book pages. I found this page on the Internet and thought I’d try the same but, instead of laying the pages straight, I’d just stick them in all directions. While the result is good, this is a bit of a pain as it takes much longer (there is always a tiny bit of visible wall and you need to add another page). But it also has its advantages: if you make a mistake, rip a page, etc., you can just wait until it’s dry and stick another page on top. Initially, I was only planning on covering the wall of the bit under the stairs, where the shape made it hard to plaster and, I’m not going to lie, my finish was anything but smooth and I couldn’t be bothered spending ages sanding it down. On that website and a few similar ones I found, they used wallpapering paste. I tried it and the result wasn’t great. I suppose it depends on the type of book you use, how thick the pages are, the finish, etc., but I found the pages were getting really wet and bubbled up and the paste wasn’t sticky enough. Bear in mind that it’s made to use with wallpaper which has been specifically primed for that purpose, and we’re just using normal, non-shiny paper. Other places suggested “decoupage medium”, which is basically diluted PVA. This worked better, but in the end I realised that the stickier and thicker the paste, the better, and ended up using straight PVA. 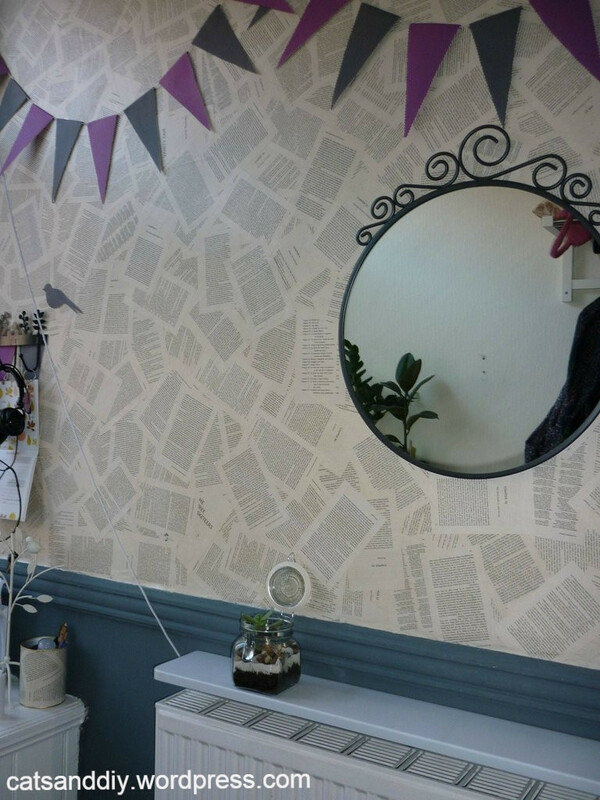 Like it happens with non-vinyl wallpaper, when you paste the pages they’ll get wet and expand, but even though a few seconds after applying them on the wall they started to bubble up, the bubbles disappeared when they dried out (well, most of them!). Then there’s the thing about ripping pages off books, which I wasn’t too sure about, but suppose you’re not really destroying it but rather putting it to good use in a different way. I found a few places that sold the classics for 99p, so if it’s a book you already have that’s acceptable, right? I ended up getting 2 copies of The Three Musketeers because it was the thickest one. First of all, prime the wall with a coat of PVA and let it dry off. That’ll seal any loose bits and get it ready to apply the pages. Then, cut off the pages making sure the edges are straight. Fill the tray with PVA and brush some onto the page, making sure it covers all the corners. Apply the page onto the wall and smooth out any air bubbles with the brush (I used a wallpapering brush here as it made it easier and quicker, but you can just use a paintbrush). As I said before the pages bubble up a bit when they get wet with the glue, so I found the best technique was doing it by layers, avoiding overlapping pages until they were dry. That way you avoid all the bubble problems. When they dry off, you’ll see some of them might have curl around the corners. If that happens, just brush some PVA onto the bits that curl up/stick out, stick them back to the wall, and wait for them to dry. Depending on the temperature and humidity of the room (and how much PVA you used) it might take a while to dry. What I’d normally do is start sticking the pages (without overlapping) from one side to the other and by the time I got to the other end of the wall the first pages I’d stuck would be dry. But then again, that’ll depend on the size of the wall as well, so if they’re still wet you’re better off waiting til they dry before overlapping them. If you’re covering up a big wall, this process takes a long time and energy, especially if you have to go up and down the ladder for every page like I had to, so be patient! Once you’re happy with the results and you’ve covered up all the wall, wait until it’s completely dry and then seal it off. Again, different places recommended different solutions here, but most of them agreed on using a polyurethane-based varnish to make the surface a bit more durable. I ended up buying Wilkinson’s Quick Drying Clear Varnish, which is sold to be used as an ultra-tough wood varnish. I chose a matt one, but you could also go for a gloss finish. Give the wall at least 3 coats of varnish. When you apply it, again, the book pages might get a bit wet and bubbly, so don’t wet the brush too much and leave enough time to dry between coats. And that’s it, really. It takes a while, but it’s really easy and the result is quite good. I had only planned on doing that bit under the stairs, but after stripping off the wallpaper and realising the walls weren’t completely smooth (and, again, avoiding having to plaster) I ended up doing the rest of the hall. Thank you! Haha, it is a helmet, and I’m not going to lie, it looks a bit ridiculous when worn!